Below is a story that ran in today’s Wall Street Journal (Page A 3) on the FDA workshop I attended a few week ago at the Keck Graduate Institute in Claremont, CA. We filed an orphan drug application for Cyclodextrin for the treatment of Niemann Pick Type C disease, an ultra rare cholesterol disease that afflicts our twins Addi and Cassi. Amy Dockser Marcus, Pulitzer Prize winning health reporter, was at the FDA workshop and wrote a story about our filing which accompanies the main story on the FDAs Workshop for Orphan Diseases. 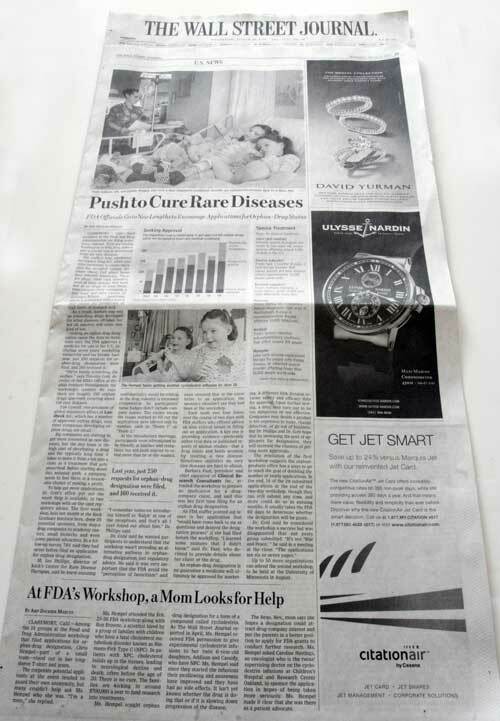 Thanks to Amy and the Wall Street Journal for giving Rare Diseases the attention they deserve! The story in currently running online on the front page of the Wall Street Journal’s website. CLAREMONT, Calif.—Among the 14 groups at the Food and Drug Administration workshop that filed applications for orphan drug designation, Chris Hempel—part of a small team—stood out in her long-sleeved T-shirt and jeans. The corporate potential applicants at the event tended to guard their own anonymity, but many couldn’t help ask Ms. Hempel who she was. “I’m a mom,” she replied. The FDA doesn’t require an applicant for orphan drug designation to be able to run a trial or make the drug, or even be a researcher. Ms. Hempel attended the Feb. 25-26 FDA workshop along with Ron Browne, a scientist hired by a group of families with children who have a fatal cholesterol metabolism disorder known as Niemann-Pick Type C (NPC). In patients with NPC, cholesterol builds up in the tissues, leading to neurological decline and death, often before the age of 20. There is no cure. The families are kicking in around $700,000 a year to fund research into treatments. Ms. Hempel sought orphan drug designation for a form of a compound called cyclodextrin. As The Wall Street Journal reported in April, Ms. Hempel received FDA permission to give experimental cyclodextrin infusions to her twin 6-year-old daughters, Addison and Cassidy, who have NPC. Ms. Hempel said since they started the infusions their swallowing and awareness has improved and they have had no side effects. It isn’t yet known whether the drug is doing that or if it is slowing down progression of the disease. The Reno, Nev., mom says she hopes a designation could attract drug-company interest and put the parents in a better position to apply for FDA grants to conduct further research. Ms. Hempel asked Caroline Hastings, an oncologist who is the twins’ supervising doctor on the cyclodextrin infusions at Children’s Hospital & Research Center Oakland, to sponsor the application in hopes of being taken more seriously. Ms. Hempel made it clear that she was there as a patient advocate. She had a hot-pink binder—her daughters’ favorite color—in which to file the application and documents. At the meetings with the FDA staffer, Ms. Hempel and Dr. Browne picked up an important tip: They were missing a required document—a cover letter written to Timothy Coté, director of the FDA’s Office of Orphan Products Development, and signed by the sponsor, Dr. Hastings. Ms. Hempel hastily tracked down the doctor and got her to FedEx a signed cover page.